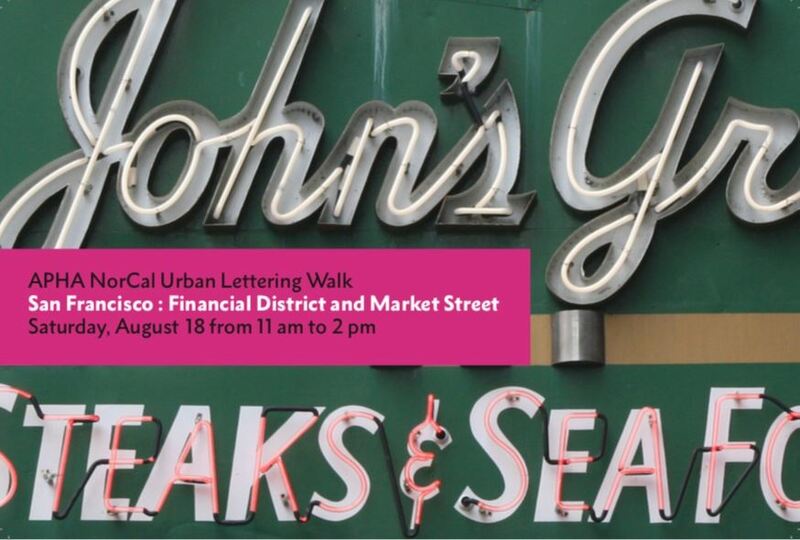 Saturday, August 18, 2018, 11 a.m. – 2 p.m.
Join design historian and lettering maven Paul Shaw for his second APHA NorCal urban lettering walk. This time the walk will begin and end in the Financial District. In between we will explore the Market Street corridor from Main Street to Mason Street with detours into the adjoining neighborhoods. The lettering in this part of San Francisco represents a rich mix of classical Roman inscriptions, late 19th century Artistic Printing styles, Art Deco and 1920s Gothic, neon signs, and some 1960s Art Nouveau. The tour will end with a group lunch. Paul has been leading urban lettering tours since 2005, mainly in New York City but also in Montreal, Boston, Philadelphia, Baltimore, Chicago, Seattle, Portland, and Los Angeles. $15 for APHA NorCal members and $20 all others. Attendance is limited to 20 people. The walk is co-sponsored by Legacy of Letters. The walk is co-sponsored by Legacy of Letters.